The Headland Villa 3, luxury 3 bedroom beachside villa, is an idyllic paradise steps from the relaxed sandy beach coastline. Ideal for family holidays. 4 bedroom beachside property with the bay's quiet lapping water just in-front of the private pool, a modern tropical paradise in Bophut. 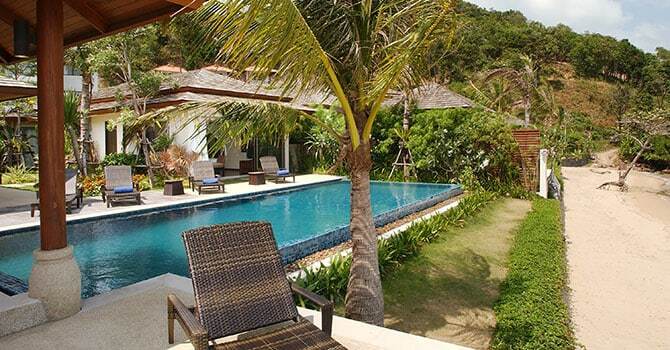 4 bedroom villa, blends ease & comforts with tropical style in beautiful Bophut. So far at the end of the bay it's as good as a private beach. 7-bedroom modern and private beachfront villa, with incredible facilities, overlooking the sensational limestone islands in Cape Yamu. The beaches are amazing in Thailand. White sand, palm-fringed, calm waters in protected coves and bays. 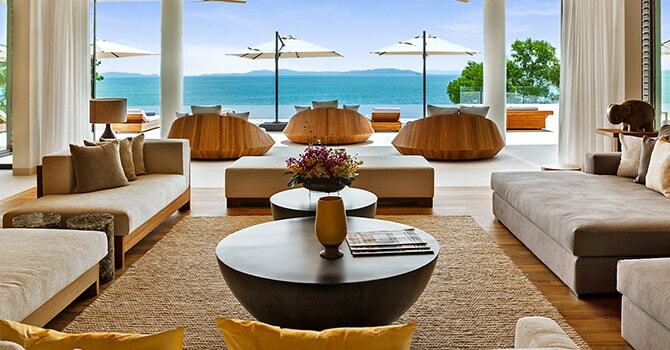 Thailand is a great choice for a beachfront villa holiday. Thailand would never have the same appeal without it’s beautiful people. Mainly Buddhist, the relaxed & accepting attitude to changing life is evident in the ambience and all interactions. It makes for a very calm and free place where you don’t need to feel guilty about spending some time-out for relaxation. 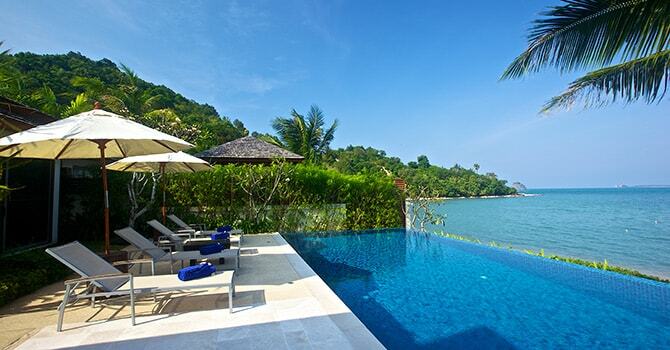 And this is exactly why your next villa vacation should be a Thailand luxury beach villa. There is so much to do on a private villa holiday here. Nearly every villa on the beach will have watersports equipment like kayaks and paddle boards. To be able to wander a few steps from your pool directly onto the beach is a fantastic feeling. You get to enjoy the vibes and energy of the sea, and the relaxation of the horizon whilst lounging by your pool. Being right next to the beach provides privacy at the same time as the feeling of being part of the daily beach activity. It can be a lovely part of the day to take a relaxing walk along the beach. In the evening there may well be bars and restaurants on the beach not too far from the villa. Alternatively you can ask your villa manager to organise transport to the restaurant of your choice, or stay in the villa as a group and enjoy the evening in your private space. Then there is the housekeeping staff and your private full-time chef. Villas open different number of bedrooms so your group requirement does not have to match the villa size. And you still get all the villa amenities to use. In our search results we state the range of bedrooms that each villa will open for a booking. We list all the villas that accommodate the number of bedrooms you search so all you have to do is choose the bedroom number range that matches your group and you will be able to view every villa available. These villas offer luxurious comforts in the most stunning settings directly on the beach. With the limited number of beach villas in Phuket it is best to book well in advance. These can be found in the hills and cliffs above the beaches. There is a large selection of villas on the beach for rent here. Not all beaches in Koh Samui are swimmable so be sure to choose the right beach. Quick guide - Taling Ngam & Laem Sor are not swimmable beaches. There are three distinct seasons - the hot season from March to May, the cool season from November to February and the rainy season from June to October. But take your pick as even in rainy season this can just be an afternoon shower in a lovely day. 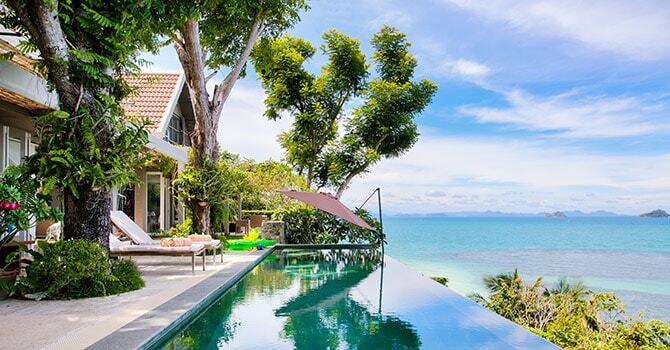 By offering the largest selection of beach villas in Thailand we are able to analyse our rentals and publish this accurate and current up-to-date data. Prices will vary based on villa location, time of year, number of nights, size of group, any booking windows and the villa premium itself. 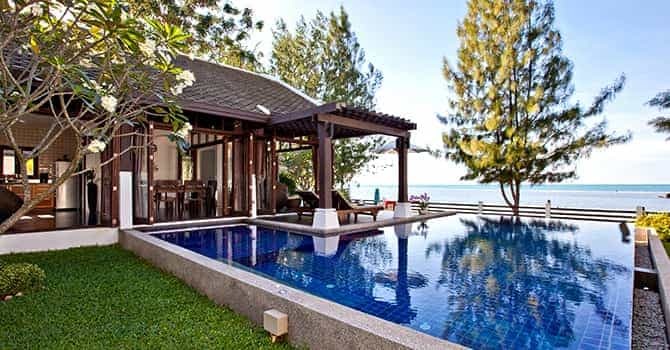 On average across 2018 Thailand beachfront villas cost USD$346.50++ per room per night in Thailand. This equates to USD$173.25++ per person. Providing a helpful guide to 2019 this average cost per person in Australia Dollars is AUD$241++ as of December 2018. This is typically 3 nights throughout the year although at peak and high season this can increase to 5, 7 and even 10 nights. At the bottom of our villa details pages we show the minimum nights required at the different times of the year. There are particular times of year when Thailand becomes very busy. The peak seasons are December, January and Chinese New Year. At these times villa bedroom pricing can increase and a larger minimum number of nights may be required to book. Plan ahead, if you are staying here during peak season then advance planning will reward you as often the flights are full up for long periods and it is much more expensive to travel and stay. With us. We have representatives on the ground in both Phuket and Koh Samui and so we can help you plan and book your excursions before you arrive. The villa staff or you can shop yourself if you wish. The staff only objective is to be helpful where they can, according to your requests. Don’t forget in nearly all villas you have a full-time chef who is on standby for a luncheon or evening barbecue. All you have to do is ask. Beach villas are perfect for children with games, swimming and fun flowing from the garden straight onto the white sand. Most villas have kayaks and paddle boards. Dependent on ages children can be accommodated in adult’s rooms or many villas also have multiple beds in one room for the kids. When you decide which villa, the Owner will hold the villa for a period of time to receive a deposit. For many passport holders travelling to Thailand it’s easy as you will receive a 30 day tourist visa on arrival at the airport with no planning required. Please check with your own government travel advisory service for further information.